Mindful Living Yoga Retreat offers you a safe and tranquil space, to re-connect with yourself, to remember how to live a simpler and more harmonious existence in-tune with the universe, the planet and our bodies. Time in the retreat will give you an opportunity to listen deeply to your body, heart, and mind. You will experience a happy living by mindfulness; and by that way, mindfulness leads you in a better true vision of life. Located at Bai Huong village, Tan Hiep commune, Island Smiles homestay is overlooked by hills and is adjacent to the sea. It is only 70m to the Bai Huong sandy beach where coral reefs can be found at low tide. In addition, there are colourful fish, crabs, and marine seaweed. The local residents here are warm and friendly. They enjoy a sedate pace of life and create an unhurried, very relaxed village atmosphere. Island Smiles Homestay is the childhood dream of a local girl, a perfect place where our friends from all over the world can experience the real Vietnamese lifestyle. Enjoy local flavours and take tours accompanied by residents to experience the true culture of Vietnam. Then let your heart rest as you relax at the end of the day. Book through Yoga in Vietnam and claim an exclusive $40 USD discount off the retreat rate. To save your mat, a non-refundable deposit of $77 USD per person is required. The remaining cost is paid directly to the retreat organizer two weeks before the retreat starts. Thank you for your inquiry regarding Mindful Living Yoga Retreat on Cham Island. Our team will be in touch shortly. Please check your junk mail / spam for our reply, just in case. Namaste. Rahul Chamoli was born in Rishikesh, the world capital of Yoga. According to a famous saying in India: “ If you are born in Rishikesh, you already have yoga in your blood”. Before his path in Yoga, Rahul Ji finished his bachelor with a major in hospitality in Odisha, India. After 4 years of studying in India he went on to work as a Chef de partie in the Maldives for 5 years. Not long after returning home, he had the luck of meeting his Guru Narendra Gusain at his uncle’s Yoga institute named “Rishikesh Yog Peeth” in Rishikesh. After some time and a lot of observation during discussions about the Yoga Philosophy, Rahul realized that there was no doubt that he belonged to Yoga and since then his Yoga journey started. Under the blessings of Shri Narayan Dutt (Narendra Gusain’s Guru) and the guidance of his Guru and best friend Vijay ji, Rahul contributed 1 year of passionate and devoted self-practice focusing on intensive deep Yoga Philosophy, Ashtanga and Hatha Yoga. After finished the training his Guru sent him to Vietnam to share and spread the knowledge and wisdom he had learned. Rahul Ji was the main teacher of many teacher training courses in the Nomad Yoga Center in Hoi An for nearly two and a half years. He enjoyed sharing his understanding of Yoga Philosophy and Ashtanga. Besides training teachers, he taught regular courses (drop-in classes), private classes as well as inspired a lot of people to Yoga. Sister Vi Nghiem is the disciple of Zen Master Thich Nhat Hanh. She practiced mindfulness meditation for 10 years in many monastic practice centers of Plum Village. She has finished a Master of Buddhist study at Mahachulalongkorn University in Thailand. She practiced and studied Vipassana meditation in Myanmar and Thailand. 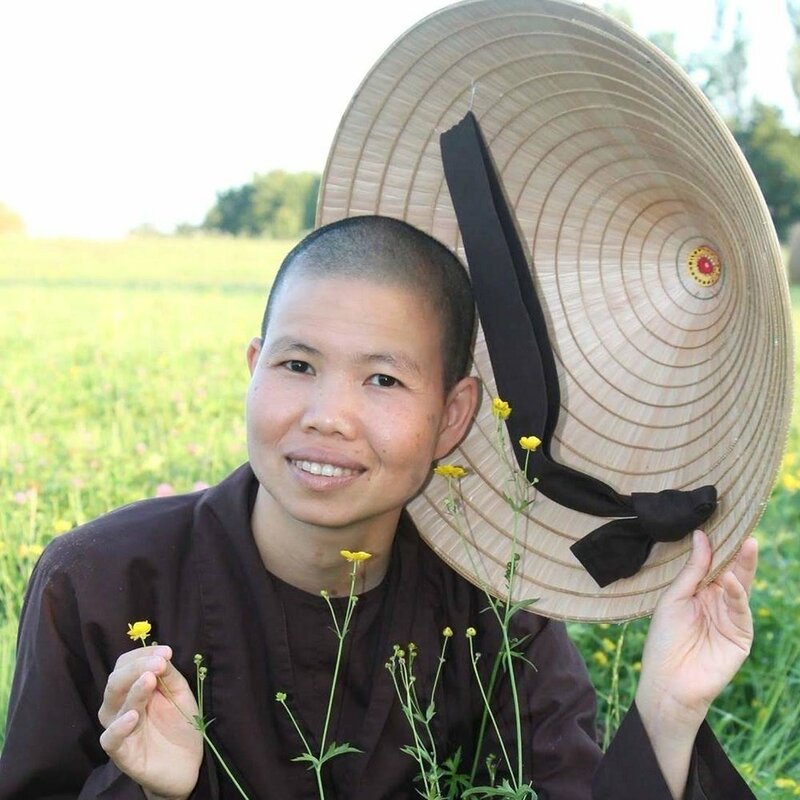 Sister Vi Nghiem has experience in teaching and guiding meditation with Vietnamese as well as foreigners. She hosted many retreats including yoga teacher training, mindfulness and Vipassana retreats. She inspires many young people to live a mindful and happy life in the Buddhist spirit. Additional activities can be organised at own cost and on demand. This offer is in partnership with Island Smiles Homestay and is subject to our Terms & Conditions.